We see fantastic examples of synchrony in the natural world all around us. To give a few examples, there were persistent reports when the first Western travelers went to southeast Asia, back to the time of Sir Francis Drake in the 1500s, of spectacular scenes along riverbanks, where thousands upon thousands of fireflies in the trees would all light up and go off simultaneously. These kinds of reports kept coming back to the West, and were published in scientific journals, and people who hadn't seen it couldn't believe it. Scientists said that this is a case of human misperception, that we're seeing patterns that don't exist, or that it's an optical illusion. How could the fireflies, which are not very intelligent creatures, manage to coordinate their flashings in such a spectacular and vast way? Steve Strogatz has worked all his life studying something that some people thought didn’t exist while others thought was too obvious to mention. It’s found in that subtle region—the haze on the horizon—that smart people, it seems, have always been intrigued by. He saw something there, and went and looked closer. What drew him on was a pattern in Nature that showed, surprisingly, that an enormous number of things sync up spontaneously. His research covered a wide range of phenomena, from sleep patterns to heart rhythms to the synchronous pulse of Asian fireflies. And now, in his new book, Sync, he’s drawn all these strands (and many others) together in a way that has the shock of the new. Even though we may see the moon every night (perhaps not realizing it’s an example of sync) it’s hard not to be surprised at the number of things around us—and in us—that must (or must not) sync up for things to go right. I’ve known Steve about ten years. We met when I called him up on the phone, wondering if he’d even take my call. I had read an article of his in Scientific American about coupled oscillators. From his first description of Huygens’ discovery that pendulum clocks would sync up if they could sense each other’s vibrations, I was fascinated, and I hoped he’d tell me more about it. He was surprisingly generous in the face of my hungry, naive curiosity and we’ve been friends ever since. Steve has that quality, like Richard Feynman’s of not only wanting to make every complex thought clear to the average person, but, also like Feynman, of actually knowing how. When we were working on the Broadway play QED, by Peter Parnell, in which I played Feynman, it’s no surprise that we asked Steve to advise us on the physics in the piece. 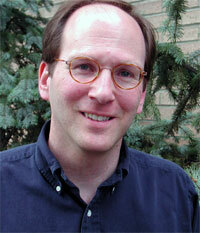 Please let me introduce you to Steven Strogatz, Professor of Applied Mathematics at Cornell University: my pal, Steve. STEVEN STROGATZ is a professor in the Department of Theoretical and Applied Mechanics and the Center for Applied Mathematics at Cornell University. He is the author of the best selling textbook Nonlinear Dynamics and Chaos: With Applications to Physics, Biology, Chemistry, and Engineering and the trade book Sync: The Emerging Science of Spontaneous Order. Who Cares About Fireflies? from Edge Foundation on Vimeo. [Steven Strogatz]: The story of how I got interested in cycles goes back to an epiphany in high school. I was taking a standard freshman science course, Science I, and the first day we were asked to measure the length of the hall. We were told to get down on our hands and knees, put down rulers, and figure out how long the corridor was. I remember thinking to myself, "If this is what science is, it's pretty pointless," and came away with the feeling that science was boring and dusty. Fortunately I took to the second experiment a little better. The teacher, Mr. diCurcio, said, "I want you to figure out a rule about this pendulum." He handed each of us a little toy pendulum with a retractable bob. You could make it a little bit longer or shorter in clicks, in discrete steps. We were each handed a stopwatch and told to let the pendulum swing ten times, and then click, measure how long it takes for ten swings, and then click again, repeating the measurement after making the pendulum a little bit longer. The point was to see how the length of the pendulum determines how long it takes to make ten swings. The experiment was supposed to teach us about graph paper, and how to make a relationship between one variable and another, but as I was dutifully plotting the length of time the pendulum took to swing ten times versus its length, it occurred to me after about the fourth or fifth dot that a pattern was starting to emerge. These dots were falling on a particular curve that I recognized because I'd seen it in my algebra class—it was a parabola, the same shape that water makes coming out of a fountain. I remember having an enveloping sensation of fear; it was not a happy feeling, but an awestruck feeling. It was as if this pendulum knew algebra. What was the connection between the parabolas in algebra class and the motion of this pendulum? There it was on the graph paper. It was a moment that struck me, and was my first sense that the phrase, "law of nature," meant something. I suddenly knew what people were talking about when they said that there could be order in the universe and that, more to the point, you couldn't see it unless you knew math. It was an epiphany that I've never really recovered from. A later experiment in the same class dealt with the phenomenon called resonance. The experiment was to fill a long tube with water up to a certain height, and the rest would contain air. Then you struck a tuning fork above the open end. The tuning fork vibrates at a known frequency—440 cycles per second, the A above Middle C—and the experiment was to raise or lower the water column until it reached the point where a tremendous booming sound would come out. The small sound of the tuning fork would be greatly amplified when the water column was just the right height, indicating that you had achieved resonance. The theory was that the conditions for resonance occur when you have a quarter wavelength of a sound wave in the open end of the tube, and the point was that by knowing the frequency of the sound wave and measuring the length of the air, you could, sitting there in your high school, derive the speed of sound. I remember at the time not really understanding the experiment so well, but Mr. diCurcio scolded me, and said, "Steve, this is an important experiment because this is not just about the speed of sound. You have to realize that resonance is what holds atoms together." Again that gave me that chilling feeling, since I thought I was just measuring the speed of sound or playing with water in a column, but from diCurcio's point of view this humble water column was a window into the structure of matter. Seeing that resonance could apply to something as ineffable as atomic structure—what makes this table in front of me solid—I was just struck with the unity of nature again, and the idea that these principles were so transcendent that they could apply to everything from sound waves to atoms. The unity of nature shouldn't be exaggerated, since this is certainly not to claim that everything is the same, but there are certain threads that reappear. Resonance is an idea that we can use to understand vibrations of bridges and to think about atomic structure and sound waves, and the same mathematics applies over and over again in different versions. There's one other story about Mr. diCurcio that I like. At one time I was reading a biography of Einstein, and diCurcio treated me like I was a full-grown scientist—at 13 or 14. I mentioned to him that Einstein was very struck as a young high school student by Maxwell's equations, the laws of electricity and magnetism, and that they made a very deep impression on him. I said that I couldn't wait until I was old enough, or knew enough math, to know what Maxwell's equations were and to understand them. This being a boarding school we used to have family-style dinner sometimes, and so he and I were sitting around a big table with several other kids, his two daughters and his wife, and he was serving mashed potatoes. As soon as I said I would love to see Maxwell's equations sometime, he put down the mashed potatoes and said, "Would you like to see them right now?" And I said, "Yeah, fine." He started writing on a napkin with these very cryptic symbols, upside-down triangles and E's and B's and crosses and dots, and mumbled in what sounded like speaking in tongues—"the curl of a curl is grad div minus del squared. . . and from this we can get the wave equation. . . and now we see electricity and magnetism, and can explain what light is." It was one of these awesome moments and I looked at my teacher in a new way. Here was Mr. diCurcio, not just a high school teacher, but someone who knew Maxwell's equations off the top of his head. It gave me the sense that there was no limit to what I could learn from this man. There was also a Mr. Johnson at this same high school, who was my geometry teacher. Mr. Johnson was an MIT graduate, and seemed to know a lot about math. One day he happened to mention that there was a certain problem about triangles that he didn't know how to solve, even though it sounded like every other problem we were hearing about in trigonometry or geometry. The question was, if two angle bisectors of a triangle are the same length, does it have to be an isosceles triangle? That is, do those two angles at the bottom have to be the same? He said that he didn't know how to solve it, and that in 20 years of teaching he had never seen anyone do so either. I'd never heard a teacher say that there was a geometry problem that he didn't know how to do, so I became interested in it. I would be in gym class, and someone would throw the ball at me and I wouldn't be paying attention and would drop the ball, still thinking about the angle bisectors. This problem began to obsess me for several months, and I had things that were close to a solution but I could never get it. It was around that time that I learned what research was. I was doing research for the fun of it; there was no grade attached to this, and I didn't even tell anyone I was thinking about it—I just wanted to solve it. One day I thought I had. It was a Sunday morning, and I called up Mr. Johnson and asked him if I could come show him the proof. He said, "Yes, come to my house. Here's where I live." I walked down to his house, and he was still in his pajamas with his kids, and line by line he checked through this proof and said, "You've got it. That's it." He wasn't really smiling, but seemed pleased. He later wrote some special remark to the headmaster of the school that I had done this problem. I went from Loomis-Chaffee to Princeton, where the path was a little bit bumpy. I started as a freshman taking linear algebra—this is the whiz-kid math course for kids who had done well in high school. The first day a professor named John Mather walked in, and we couldn't tell if he was a professor or a grad student. He was so shy, had a big long red beard, and slithered along the wall. He didn't really stride into the room—he was practically invisible. Then he began, "The definition of a field, F, is. . ." That was all. He didn't say his name, not "Welcome to Princeton,"—nothing. He just began with the definition at the beginning of linear algebra. It was a dreadful experience for me. It was the first time in my life that I understood why people are terrified of math. He came really close to discouraging me from ever wanting to be a mathematician. The only reason that I went on to eventually become one was that my second course was with a great teacher, Eli Stein, who's still at Princeton. It was a course in complex variables, which was a lot like calculus. I always liked calculus in high school, and I suddenly felt like I could do math again, whereas that earlier course on linear algebra was a filter. It had a very fine mesh, and only certain students could get through the holes. What was supposedly being tested was your tendency to think abstractly. Could you come up with the sorts of rigorous proofs that a pure mathematician needs? That's the bread and butter of pure math. The truth probably is that I didn't really have that in me; that wasn't my natural strength. What I really like is math applied to nature—the math of the real world. At the time I didn't know there was a thing called applied math—I thought it was physics. Now this is what I do. I ended up majoring in math because of the good experience in my sophomore year with Stein. I'd always been encouraged to be a doctor, but always resisted, because I knew that I wanted to teach math. But in my junior year my parents encouraged me to take some pre-med courses, like biology and chemistry, and even though it was getting to be pretty late to become a doctor I agreed. My brother the lawyer convinced me with a persuasive argument that it was irrational to keep resisting: I wasn't committing to being a doctor, and it wouldn't hurt to learn biology and chemistry. I accepted that, and it made for a pretty hellish year because I was taking freshman biology, with its lab, freshman chemistry, with another, and organic chemistry, which supposedly depended on freshman chemistry. This is a lot for someone who's not good in the lab. Even though this pre-med year was a lot of work to be doing alongside a math major I actually liked the biology and chemistry courses, especially the idea that DNA was a double helix, and that this shape would immediately indicate its function. It explained how replication would work. I was perfectly content, and even took a pre-med Stanley Kaplan course to prepare for the MCATs. Still, when I got home for spring vacation my mother got a look at my face and said, "There's something wrong. Something's really bothering you. What's wrong? How do you like school?" I said, "I like it, it's fine, I'm learning good stuff." But she said, "You don't look right. You don't look happy. Something's wrong, what's wrong with you?" I didn't really know. I said, "Maybe I'm tired. I'm working a lot." But she said, "No, something else is really wrong. What are you going to take next year? You'll be a senior." I said, "That is bothering me because, being a pre-med so late, I'm going to have to take vertebrate physiology, some biochemistry, and all these pre-med courses. Plus I have a senior thesis in the math department, which means that my schedule is going to be so full that I'm not going to be able to take quantum mechanics." And she said, "Why does that matter to you?" I said, "I've been reading about Einstein since I was 12 years old. I love Heisenberg, Niels Bohr, Schrödinger—I could finally understand what they're really talking about. There are no more verbal analogies and metaphors; I can understand what Schrödinger did. I've worked my whole life to get to this point, and I'm ready to know what the Heisenberg uncertainty principle really says, and I'm going to be in medical school, cutting cadavers, and I'm never going to learn it." So she said, "What if you could just say right now, 'I want to do math. I want to do physics. I want to take quantum mechanics. I'm not going to be a doctor. I want to be the best math teacher and researcher I can be.'" And I just started crying. It was like a tremendous weight had been lifted. We were both laughing and crying. It was a moment of truth, and I never looked back. I'm very thankful I had such good parents, and that I was able to find a passion by denying it for awhile. Some people go their whole life and never really figure out what they want to do. When it was time to do a senior thesis—at Princeton everyone is required to do one—I wanted to pick something about geometry in nature, although I didn't know exactly what. My adviser, Fred Almgren, who was famous for studying the geometry of soap bubbles, suggested a problem about DNA geometry. Could we understand, for instance, what it might be about DNA that allows it to unwind itself without getting tangled? Given that it's so long, you'd think maybe it would get tangled occasionally and that this would be deadly if it happened in the cell. What keeps it from doing that? By working on this project I got to learn about DNA, and wrote a senior thesis about its geometry. I collaborated with a biochemist to propose a new structure of something called chromatin, which is a mixture of DNA and proteins that makes up our chromosomes. It's the next level of structure after the double helix. We know that the double helix gets wound around little spools of protein called nucleosomes, but no one knows how the nucleosomes themselves become arranged like beads on a string or how that structure is wound up to make chromosomes. My biochemical adviser and I ended up publishing a paper in the Proceedings of the National Academy of Sciences, and it was very exhilarating. I was now doing research in mathematical biology, so even though I wasn't a doctor, I was using math in biology about real stuff, about chromosomes. That was when I realized that I wanted to be an applied mathematician doing mathematical biology. I went to England and studied at Cambridge on a Marshall scholarship and was completely bored with the traditional program—the stuff that G. H. Hardy describes in his book, A Mathematician's Apology, known as "the Mathematical Tripos." Cambridge has had the same kind of course since Newton, and I was bored with it. One day I found myself wandering into a book store across the street, where I picked up a book with the unlikely title, The Geometry of Biological Time. I say unlikely because I had subtitled my own senior thesis, "An Essay in Geometric Biology." I thought I had made up this phrase—geometric biology, the juxtaposition of geometry and biology, shape and life—and here was somebody using practically the same title. So who was this guy, Arthur T. Winfree? I started reading the book, and thought he was nuts; he looked like a crackpot. I didn't know if I should believe that he was serious because the titles of his chapters have puns in them, he has data from his own mother about her menstrual cycle over many years, and it's all about the cycles of living things. At the time Winfree, who just died on November 5, 2002, was not someone who was really on the map. He was a professor of biology at Purdue. I glanced at the book, put it back on the shelf, and found myself coming back a few days later and read some more, and eventually bought it. Partly because I was so lonesome in England, suffering from culture shock, and partly because this book was so entrancing to me, I started reading and underlining it every day, and fell in love with the vision of living things with many cyclic processes, from cell division to heartbeat to rhythms in the brain, jet lag and sleep rhythms, all described by a single mathematics. This is what Winfree was proposing in his book, and it really is what got me started in the direction of studying synchrony. One theory was that there might be a leader. It sounds ridiculous, because why would there be one special firefly? We don't believe that there is a leader any more, or that there might be atmospheric conditions that cause synchrony, like if a lightning bolt startled every one of them, and made them start flashing at the same time, which would cause them to stay together. Synchrony occurs on nights that are perfectly clear. It was only in the 1960s that a biologist named John Buck, from the National Institutes of Health, and his colleagues started to figure out what was really going on, which is that the fireflies are self-organizing. They manage to get in step every night of the year and flash in perfect time for hours upon end with no leader or prompting from the environment, through what is essentially a very mysterious process of emergence. This is a phrase that we hear all the time, but this is emergence in the natural world. The thinking now is that individual fireflies are able not only to emit flashes but also to respond to the flashes of others—they adjust their own timers. To demonstrate this, Buck and his wife, Elisabeth, who was with him on this trip to Thailand in the mid-'60s, collected bags full of male fireflies, brought them back to their hotel room in Bangkok, and released them in the darkened room. They found that the fireflies were flitting around and crawling on the ceiling and walls, and that gradually little pockets of two and then three and four fireflies would be flashing in sync. Later lab experiments showed that by flashing an artificial light at a firefly you could speed up its rhythm, you could slow it down, make it flash a little later than it would otherwise. The point is that each firefly sends a signal that causes another firefly to speed up or slow down in just the right way so that they end up inevitably coming into sync, no matter how they started. You might ask why that matters—who cares about fireflies?—but there are lots of reasons why you should care: The first may be that all kinds of applications in technology and medicine depend on this same kind of spontaneous synchronization. In your own heart, you have 10,000 pacemaker cells that trigger the rest of your heart to beat properly, and those 10,000 cells are like the thousands of fireflies. Each one could have its own rhythm, in this case an electrical rhythmic discharge. Instead of communicating with light they're sending electrical currents back and forth to each other, but at an abstract level they're the same. They are individual oscillators that want to have a periodic repetition of their state, and can influence each other. They do so in such a way that they conspire to come into sync. Sometimes, of course, sync is undesirable. If it occurs in your brain on a vast scale it results in epilepsy. There are other medical and technological applications. The laser, one of the most practical gadgets of our time, depends on light waves in sync, atoms pulsing in unison, all emitting light of the same color and moving in phase, with all the troughs and crests of the light waves perfectly lined up. The light in a laser is no different from the light coming out of these bulbs overhead in that the atoms are not really that different; it's the coordination of the atoms that's different. The choreography is the difference, not the dancers. We see sync all around us. The global positioning system that's been used for satellite-guided weaponry in Iraq consists of 24 satellites, each of which has an on-board atomic clock, very well synchronized to a master super clock at NIST, the National Institute of Standards and Technology in Boulder, Colorado. It's only because of this perfect synchronization, down to a billionth of a second, that we can hit a license plate with a missile. It's a grim example, but then at the same time we see life itself depending on synchrony. Sperm cells beat their tails in unison as they swim toward an egg, communicating through pressure fluctuations in the fluid. I could go on and on. What's so breathtaking about the phenomenon of synchrony is that it occurs at every scale of nature, from the sub-atomic to the cosmic. It's what may have killed the dinosaurs. I could explain why it was gravitational synchrony that caused certain asteroids to be flung out of the asteroid belt and ultimately to strike our planet, probably extinguishing the dinosaurs and many other creatures. It's one of the most pervasive phenomena in nature, but at the same time one of the most mysterious from a theoretical perspective. We are used to thinking about entropy, the tendency of complex systems to get more and more disordered, as the dominant force. People always ask me, "Doesn't synchrony violate that? Isn't it against the laws of nature that systems can become spontaneously more ordered?" Of course you can't violate the law of entropy, but there is no contradiction. The point is that the law of entropy applies to a certain class of so-called isolated, or closed systems, where there's no influx of energy from the environment. But that's not what we're talking about when we discuss living things or the earth. Where systems are far from thermodynamic equilibrium all bets are off, and we see astonishing feats of self-organization, synchrony just being the simplest such example. The same laws that give rise to entropy and the tendency of systems to become more and more disordered are the same laws that will account for synchrony. It's just that we don't have a clear enough understanding of the thermodynamics of systems very far from equilibrium to see the connection—but we're getting there. We're learning a lot about spontaneously synchronizing systems, at least in physics. We know how a laser works, and there's nothing that violates entropy about that. For living examples, like heart cells, we have a rough idea about how electrical currents are passed back and forth. But synchrony also touches on some of the deepest mysteries of our time, like consciousness. There's some thought, at least according to some neuroscientists, that what distinguishes consciousness from other forms of brain activity is the synchronized firing of the cells involved at specific frequencies close to 40 cycles a second. What I like about this whole area of thinking about spontaneous order, or self-organization, is that I really do believe that many of the major unsolved problems of science today have this same character. Architecturally they involve millions of players, whether they're neurons, heart cells, or players in an economy. They're all interacting, influencing each other through complex networks and via complicated interactions, and out of this you sometimes see amazingly organized states. Stuart Kauffman calls this "order for free." Many of us are really trying to climb that same mountain from different perspectives. Kauffman and others see it as a matter of understanding evolution better. When he or Gell-Mann speaks of complex adaptive systems the emphasis seems to be on the word adaptive, suggesting that the key to understanding the mystery is to learn more about natural selection. However, you didn't hear me really talk about evolution at all. I feel like they're barking up a tree that's deeper into the forest. There's a right place to start, and the simplest place to start is to think about problems where evolution plays no part. I want to think about purely physical systems that are complex in their own right and how, just from the laws of physics, we get these self-organized patterns. It feels to me like I would want to understand that first, before I add the further complication of evolution. We know that's important, but that's starting at the wrong place. Recently, I keep finding myself wanting to learn more about cancer and what it is about the network of cells or the network of chemical reactions that goes awry in a cancerous cell. There are certainly some cases where a single gene may be screwed up, but I don't believe that all cancers will be explained that way. It's been 35 years since Nixon declared war on cancer and we haven't really understood it. Understanding oncogenes is a great start, but that can't be it. Again, it's about choreographies of proteins and genes and the missteps, not just of single dancers, but of the way that they're moving together. Cancer is somehow a dynamical disease that we won't understand through pure biological reductionist thinking. It's going to take a combination of reductionism to give us the data, and new complex systems theory, super computers, and math. I would like to be part of that. Biologists often emphasize the part that computers will play, and it's true that computers will be indispensable, but there's a third leg, which is good theoretical ideas. It won't be enough to have big computers and great data. You need ideas and I think that those ideas will be expressed in the language of complex systems mathematics. Although that phrase, complex systems, has been talked about a lot, I hope people out there appreciate what a feeble state it's in, theoretically speaking. We really don't understand much about it. We have a lot of computer simulations that show stunning phenomena, but where's the understanding? Where's the insight? There are very few cases that we understand, and so that brings me back to synchrony. I like that example of synchrony as a case of spontaneous order because that's one of the few cases that we can understand mathematically. If we want to solve these problems, we've got to do the math problems we can do, and we need the simplest phenomena first, and synchrony is among them. It's going to be a long slog to really understand these problems. Another thought, though, is that we may not need understanding. It could be that understanding is overrated. Perhaps insight is something that's been good for three or four hundred years since Isaac Newton, but it is not the ultimate end. The ultimate end is really just control of these diseases, and avoiding horrible ecological scenarios. If we could get there, even without knowing what we're doing, that would maybe be good enough. Computers might understand it, but we don't have to. There could be a real story here about the overrating of understanding. In broad strokes, there were hundreds of years after Aristotle when we didn't really understand a whole lot. Once Kepler, Copernicus, and Newton began explaining what they saw through math, there was a great era of understanding, through certain classes of math problems that could be solved. All the mathematics that let us understand laws of physics—Maxwell's equations, thermodynamics, on through quantum theory—all involve a certain class of math problems that we know how to solve completely and thoroughly: that is, linear problems. It's only in the past few decades that we've been banging our heads on the non-linear ones. Of those, we understand just the smallest ones using only three or four variables—that's chaos theory. As soon as you have hundreds, or millions, or billions of variables—like in the brain—we don't understand those problems at all. That's what complex systems is supposed to be about, but we're not even close to understanding them. We can simulate them in a computer, but that's not really that different from just watching. We still don't understand.